Digital Marketing is the process of marketing products and services through digital mediums. These mediums include email, websites, text messages, and many other digitally-based platforms. 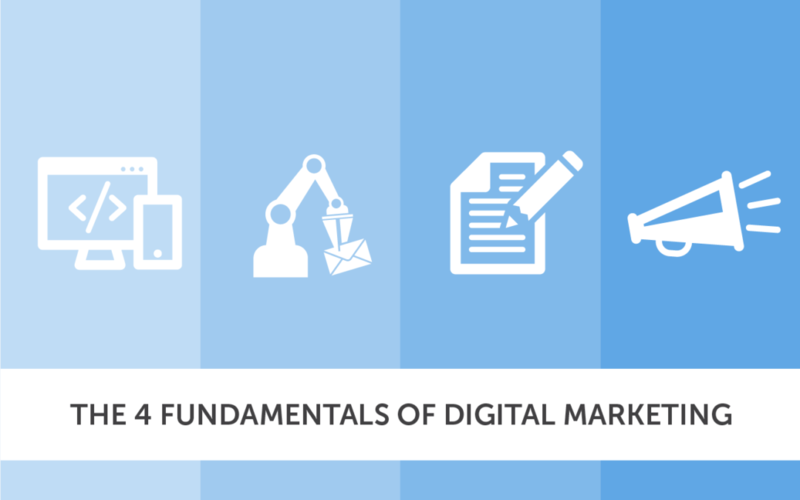 For the purpose of this article, I want to share what we at DVS believe to be the four fundamental building blocks of a successful Digital Marketing program for your company. Get these four fundamentals right, and you will see your inbound lead generation and sales conversions soar. Ignore them and see your money disappear, often without a measurable return on your investment. Now that we have introduced the four fundamentals, let’s learn about each. To put it bluntly, if your website is not the absolute best amongst its competitors you won’t make it to the first page of Google’s search results. The algorithms Google has in place are able to accurately identify poorly designed and programmed websites. Once your website has been identified as lacking in the search engine optimization (SEO) department, your site will get buried deep within the numerous pages of search results. This is a big deal, as websites that make the first page of Google search results account for over 91% of internet traffic. Put simply, people just don’t go to the second page of Google. Pleasing Google is only half the problem. Once people get to your website, it better have an outstanding UX/UI in order to satisfy the needs that brought them there in the first place. If your site is not mobile responsive, intuitive, attractive, and full of what your visitors are looking for, then once again, you lose. Above all, remember who your website is crafted for: not your designer, not you the owner, but for your customers! After all, they do call it User Experience (UX/UI) for a reason. Learn about website optimization on the SEO service page of our website, and check out the Beginners Guide for Google’s Ranking Factors for a more detailed review SEO best practices. Modern Inbound Lead Generation is all about having qualified leads automatically delivered to your sales team, rather than having them spend their time going out and acquiring them cold. The engine that makes this possible is Marketing Automation. A marketing automation system is your 24x7 sales team that never takes a break, gets sick, goes on vacation, or “forgets” to follow up on an opportunity. It is your solution to automating the process of capturing leads from your digital marketing activities, driving sales conversions, and measuring the ROI from your digital marketing efforts. Don’t get me wrong, marketing automation doesn’t replace your sales team. Rather, it’s like pouring jet fuel on your efforts. The implementation of this inbound lead generation strategy is all about freeing your sales team to close opportunities, rather than hunt for leads. The number one reason your website doesn’t convert visitors to customers on their first visit is that they aren’t ready to buy at that time. Marketing automation is what tracks them from that first visit and nurtures your relationship with them until that time when they are prime to convert. Dive deeper into how marketing automation works on our Marketing Automation service page. Original content publishing (OCP) is vital to your success in attracting both Google and human visitors to your website and related digital properties. Original content is understood to the be number one ranking factor that Google uses in determining your position on its search engine results pages (SERP). What is considered authoritative original content? Authoritative original content is content that informs, educates, or solves a problem that people are searching for better than content found on other sites. Original content publishing is considered the “long game” of the two promotional efforts you should use to drive traffic to your website and other digital properties. It’s a long game because, unlike Online Advertising, OCP efforts often take six to twelve months to yield measurable ROI. This longer timeline is due to the time it takes to create and publish authoritative original content, the time it takes Google to crawl and index your content, and finally the time it takes for enough people to click through to your content for Google to recognize it as authoritative and reward you with a high “Organic” SERP ranking. Organic and Paid are the two distinct types of search results displayed on a search engine results page. 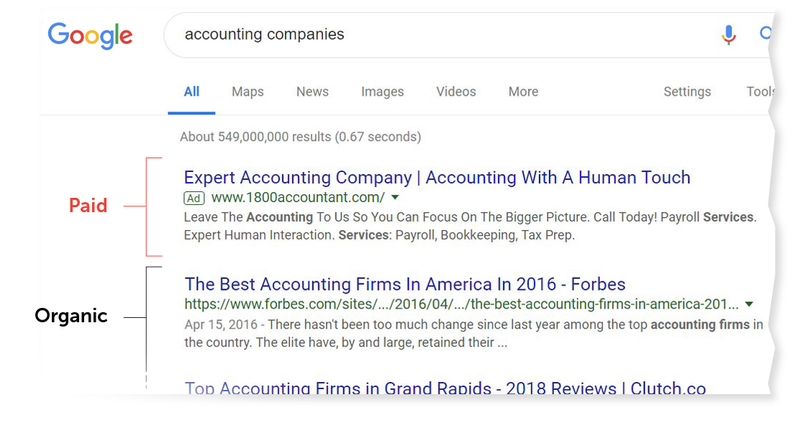 Google makes it simple to identify paid advertisements by adding the word “Ad”, as shown in the below graphic, in front of the search result. In our experience at DVS, both types of search results can yield an ROI. However, organic search results are by far the most valuable and have to be earned through OCP of authoritative content that people are looking for! Not to be overlooked is original content publishing on Social Media, such as Facebook, Instagram, Twitter, LinkedIn, and others. A cornerstone of many B2C digital marketing campaigns is the heavy publishing of original content on as wide a network of social channels as possible. Your contribution of informative and entertaining content via social channels not only helps build brand awareness, but it also can go a long way to establish your creditability as a knowledge leader in your given industry. Learn how DVS can satisfy your OCP needs by visiting our Copywriting services page. Then visit our blog to learn about Augmented Reality: A Modern Marketing Tool and Why Infographics Work. Now, onto the short game of how to quickly drive traffic to your website and other digital properties: Online Advertising. Online advertising is the fundamental that leverages the spending of “ad dollars” to place your call to action (CTA) in front of prospects. Frequently referred to as Paid Advertising, Search Engine Marketing (SEM), or pay-per-click (PPC), it is the short game due to its immediate ROI (if done right) and the fact that it stops working just as fast as you stop paying for it. Search Advertisements display on search engine results pages – in direct relation to specific keywords and phrases that people enter. They can take the form of plain text ads as shown in the screen capture in the previous section, or they can be highly-visual product listing ads employing pictures of your products along with pricing information. Search advertising is most effective for capturing searcher intent. In other words, the content of search ads is focused on the very thing that the person is searching for. For example, I recently did a search on Google for carbon monoxide detectors for my home. Even before I could see the organic search results, I was presented with paid ads, local businesses ads, and Popular Product ad sections that were inserted at the top of my search results. When you are looking for immediate results, search advertising is often your best strategy. Their ability to display exactly what a person is looking for, at the time they are looking for it, provides your best chance for immediate conversions and sales. Display Advertisements are not directly related to search results and show up alongside original content on websites, YouTube videos, blogs, news outlets, and a multitude of other locations. Like search ads, they take the form of plain text, however, they are much more likely to be a highly-designed banner ad, animation, video, or even pop-up. Display advertising is most effective for building viewer awareness and creditability. Whether your brand, product, or service is new or established, people have to know it exists and have trust in it. Consistent exposure to your ad via display advertising is an effective way to accomplish this objective. When brand awareness, not immediate results, is your primary concern, display advertising is often your best strategy. The ability to be seen repeatedly by prospects as they travel the digital landscape is a time-tested strategy for building brand awareness. When you think of where to spend your advertising dollars, the choices are both extremely vast and limited at the same time. Facebook Audience Network is the runner-up and held an estimated 19.6% of the Total US Digital Ad Spend in 2018, while Google commanded 37.2%. What about the other 43.2% you say? To attempt a comprehensive list of other major platforms is beyond the scope of this article. With platforms like Amazon, Bing, Snapchat, Twitter, and more ad aggregators than you can shake a stick at, I’ll just leave it to you to Google the possibilities. As an alternative to the 800-pound gorillas, you should not overlook the advertising opportunities presented by trade associations, industry publications, local business networks, and other smaller organizations focused on your particular industry niche. While not offering the massive reach, they often allow you to laser-focus your efforts on exactly the prospects you are looking for. Learn how DVS can guide you through the advertising jungle by visiting our Advertising service page. Then visit our blog to learn about Standing Out in the Crowd: LinkedIn & Trade Show Marketing. Now that you know the fundamentals, where should you start? I put the fundamentals in this order for a good reason. These are the basics that comprise a sound digital marketing program and work best when executed in order. Each step builds upon the previous to help a brand or organization establish and grow their digital presence. It starts with an optimized website, gains traction through marketing automation, builds authority with original content publishing, and drives visitors via online advertising. If you have questions or are looking for help with your digital marketing efforts, I’m always interested in listening. Contact me at paul@dvs.com.